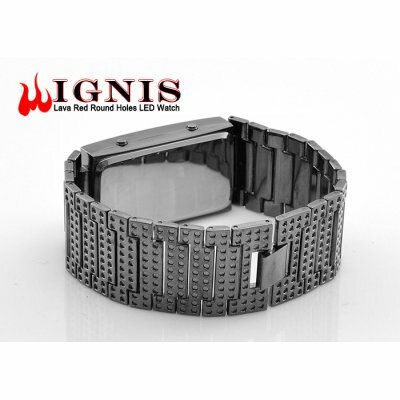 Successfully Added Ignis - Lava Red Round Holes LED Watch to your Shopping Cart. Like lava erupting from a volcano, the red LED lights of the Ignis LED Watch watch glow from the depths of the black holes, informing you of the time/date in a unique and mesmerizing way. Leading the charge in creating innovative timepieces, the Ignis LED Watch merges modern technology with a fashionable avant-garde look. Red lights flowing out of a black darkness, the chaotic round holes design that's actually quite systematic; if anything, the Ignis LED Watch is a trendsetter. Just try to search for the Ignis LED Watch online. Google: Nothing. Yahoo: Nada. Bing: Nope. Here's why: The patented design of the Ignis LED Watch has yet to be seen and is completely new on the market. Resellers: Now is the time to act fast. Stock a few online and start a new trend of cool LED watches before anyone else! Or buy a few for your local store and watch as customers stare at the unique, never-before-seen design. End Customers: In a time where LED watches are no longer new, it's hard to find a concept or design that people haven't seen. When wearing the Ignis, however, it won't be "Oh that, didn't I just see it online? ", but more like "Whoa! What is that design? Awesome!". The Ignis LED Watch is available in our warehouse now for immediate orders. Order today and our lightning fast logistics team will express ship it out tomorrow, guaranteed. Brought to you by the leader in China wholesale electronics - Chinavasion. Hello, I'm from Brazil and I'm interested in buying products with you, I want to know the delivery time and if you wrap gift, thank you very much now.